The heat and smoke are finally letting up here, this was the view from our backyard a couple of nights ago with smoke from local wildfires. 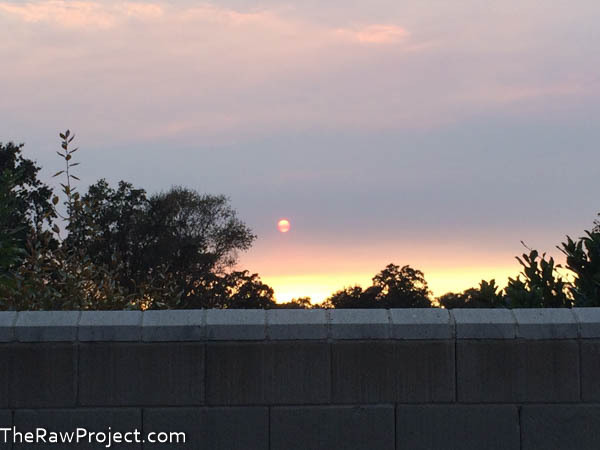 The sun was an eerie red color and it was just miserable with triple digit heat and the smell. I feel terrible for those affected by the fires too, horrible stuff on the news. This morning is overcast and in the 60s, a welcome change after last week and perfect running weather for a long run shortly! 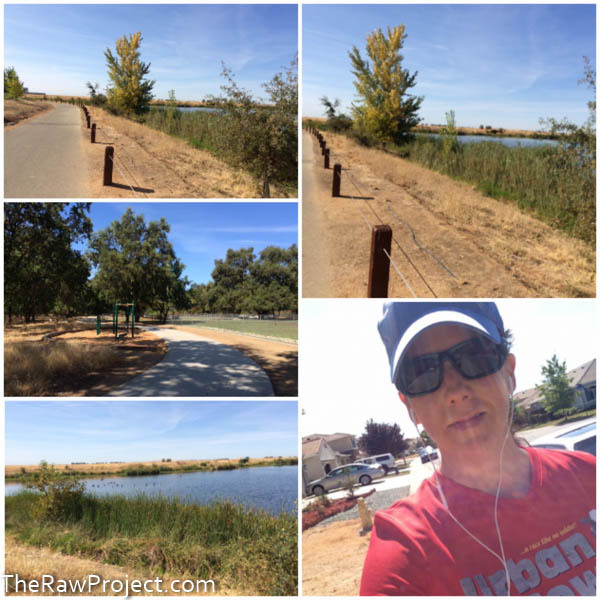 Last week’s 10-mile run went smoothly with beautiful trails and wildlife sightings. I love running by our local dog park on Sunday mornings here, it’s such a fun social scene for people to get together, socialize, and have dog play dates. Not sure my chihuahuas would appreciate it, Leela gets a little stressed around larger dogs. 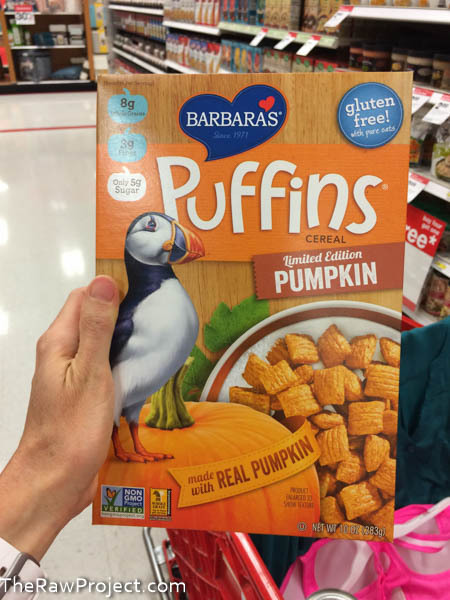 You know I appreciate whole, vegan foods most of the time here and am reluctant to jump on the pumpkin spice craze that fall brings to the blogosphere, but I couldn’t resist grabbing a box of Limited Edition Pumpkin Puffins cereal at Target last weekend. 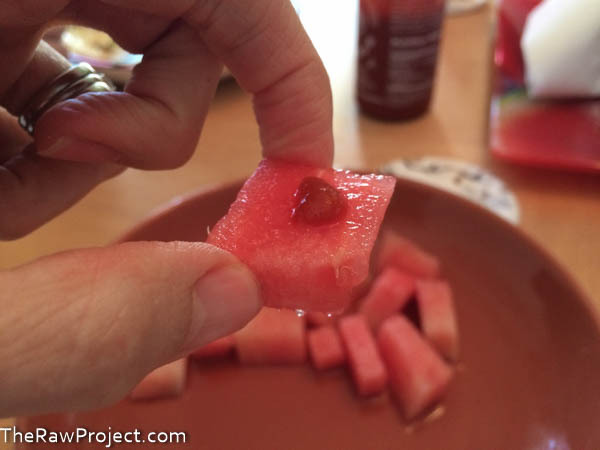 Hubby and I also tried something fun – dabs of Sriracha sauce on watermelon. It’s spicy, sweet, refreshing, and tasty. Try it if you’re a Sriracha fan. Eats have been pretty simple this week with a lot going on at work and running around. 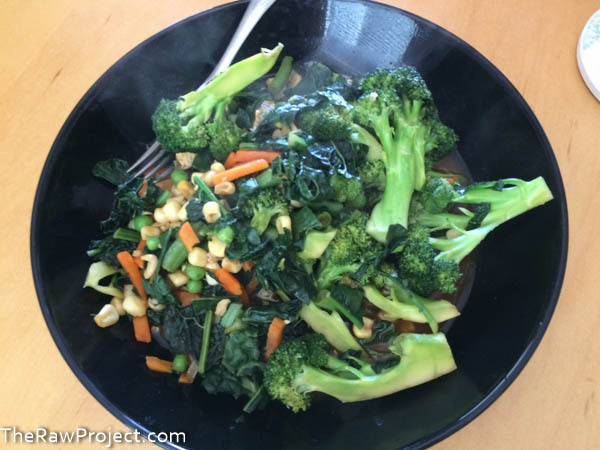 I added broccoli, kale, chopped onion, and a blend of frozen veggies to this tamari oil free stir fry. 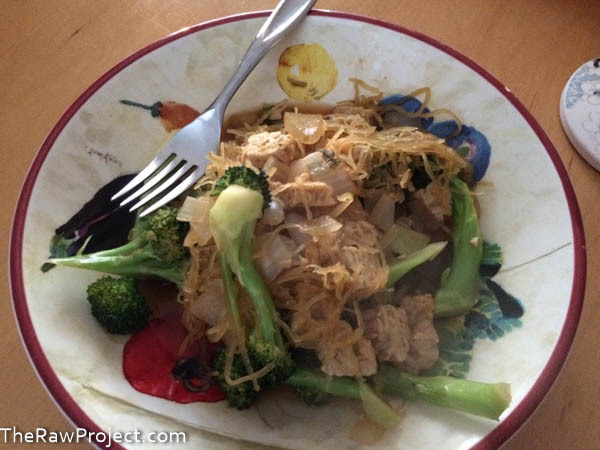 And added simply steamed spaghetti squash to this tempeh oil free stir fry for a fun way to mix it up. 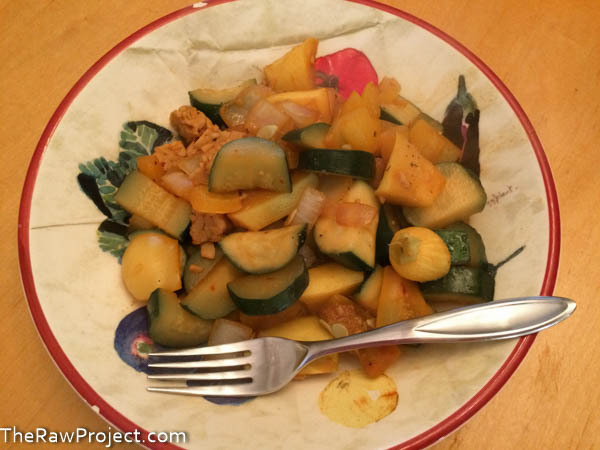 I used up a huge yellow squash from our garden with this simple summer squash stir fry. 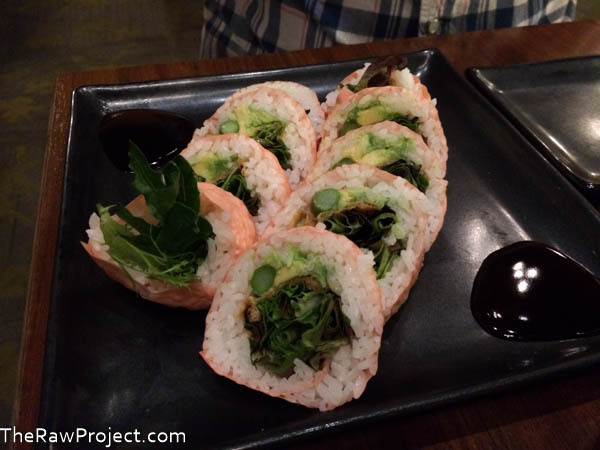 Last night I took hubby out for sushi at Mikuni’s after he endured an unsuccessful shoe shopping trip with me and was pleased to see a new, creative vegan roll on the menu and I love the name! The roll was beautiful with salsa and vibrant micro greens topping it. 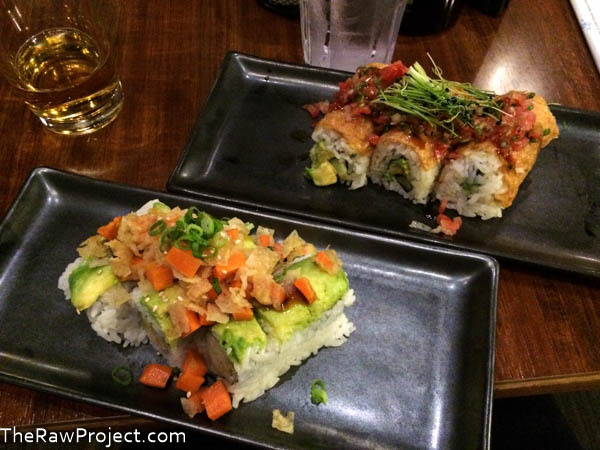 We each ordered one and a couple of other vegan rolls – the Rabbit Roll and Veg 10 for a hearty dinner. I love that they have a nice selection of unique vegan rolls that go beyond the basic cucumber and avocado rolls with interesting flavor fusion. 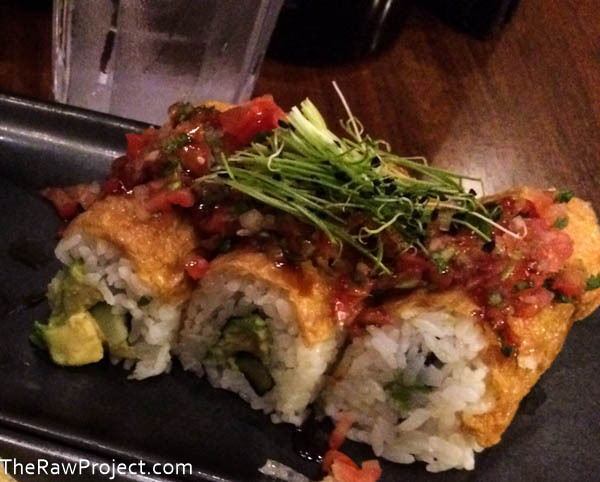 All of the rolls were good, but the Saving Nemo roll was the star with crunchy tofu and spicy salsa. But on to the list! Here are 9 protein loaded foods for vegans. This cardiologist is taking a new preventative, plant-based direction for treating patients. LifeHacker posted an interesting article last week about not being a jerk when someone is a jerk to you. So true that one bad incident can add a negative tone to the rest of the day, week, etc. It’s something I struggled with a lot working in customer service years ago and still do occasionally and have been this last week with stress at work. The article presents another way to look at rudeness and not take it personally. LifeHacker also posted a great article on starting a workout routine for those that hate working out. PopSugar has an article on getting more willpower which hit home with me this week feeling slightly stressed, tired, and emotionally drained. This is an interesting read on why industrial processed foods are deceivingly cheap. How about some positive inspiration? This couple made a dramatic change in their health switching to a plant-based diet. And another couple transformed their health too. 7 good things that happen when you give up dairy. If you’re craving pumpkin spice recipes, here you go! The Sacramento Vegan Chef Challenge is coming back in October, can’t wait! Running, laundry, and maybe a little shopping for an upcoming trip is on my agenda today. I love relaxing weekend days and I hope everyone is having a great one! Thanks on the smoke, we got another round of it yesterday afternoon from the Lake Fire and it looks just awful on the news, I feel bad for those losing homes. Hiya! Thanks for all the great comments on my blog posts! As always! Hope the wildfires stop soon! Been thinking about you guys! The watermelon with Shriracha sounds awesome! So simple but so wonderful! I will have to try it! Me too on the wildfires, the news is so sad here now for those loosing homes. Sriracha watermelon is good and kind of looks like a classy hors d’oeuvre. Thanks and it was delicious sushi! Agreed on unique vegan rolls, another local place does a great butternut squash walnut vegan roll I adore. Yeah and yikes on the smoke! Totally crazy and sad on the news.